Shelly Leitheiser’s latest exhibit, “Kinetic Connections,” is currently showing at the WARM Gallery in the Minnesota Women’s Center. Aside from being powerful commentaries about the environment, Leitheiser’s paintings in this exhibit raise questions about art and politics. For starters, Leitheiser’s paintings tell a story. That fact in itself draws the artist into a minefield. While narrative painting was once a popular and accepted style, 20th-century modernists refused to give it legitimacy and, despite the postmodern turn in the 1970s, the debate still rages. Yet, as poet and humanities professor James M. Wilson argues, as far as art deals with life, it cannot escape narrative. All art imitates narrative because, Wilson claims, “time and narrative alike are the very conditions of human life.” As we think, so do we create, and we “think” in a narrative mode. The narrative content in Leitheiser’s environmental paintings, I would argue, not only makes an understanding of our existence possible, but to a great extent allows us to contemplate the conditions of our demise. These paintings tell stories about how we relate to our environment, and what a poor job we are doing. They are stories of destruction, ignorance and carelessness—not easy stuff to absorb or get onto a canvas. Leitheiser uses design and color to render scenes rich in symbolic content. In her paintings, formal qualities and narrative content are complementary—they complete one another—defying Bell’s and Greenberg’s assertion that painting and narrative do not mix. More important, Leitheiser’s symbolism isn’t idiosyncratic and personal, but cultural, shared and accessible to all viewers. “Oblivious” depicts a man and woman dancing under an angry violet sky portending disaster. They are totally absorbed with each other and apparently haven’t a care in the world. 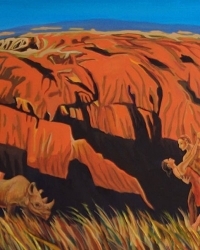 “Erosion” juxtaposes another dancing couple, a rhino and a desolate landscape to succinctly capture the interconnection between humans, animals and the earth. The Western Black Rhino shown in the painting was declared officially extinct on November 10, 2011. The eerily barren red earth, painted in jagged diagonals, dominates the canvas, with humans and animal pushed to the peripheries. This earth will never again support plant or animal life, making clear that humans are on the road to extinction. Leitheiser’s paintings involve the viewer directly in the experience of environmental destruction. The blue figures in “Habitat” stand among the trees and represent humanity as simply another life form—not a privileged species. The narrative is clear: if we refuse to acknowledge our interconnectivity with nature, we will not escape the consequences of our actions. These paintings make us contemplate and question. They bring into doubt everything we’ve been taught about the intelligence and superiority of the human species, the necessity of unlimited capitalist growth, the stewardship of governments, and the ability of laws to curtail corporate greed and destruction. This is what good narrative—pictorial or literary—is supposed to do. Through a mix of color, design and narrative, Leitheiser gets us to think, and perhaps to do. Contrary to its critics, narrative painting is not mere storytelling. It reveals something about the human condition, but not in broad, ahistorical terms—that would be simply platitude. Good narrative situates the artwork in a particular moment and forces us to confront that moment. It is essentially dramatic, in the sense that it depicts conflict. It pulls in the viewer, who then becomes an extension of that drama. Unlike most dramas, however, Leitheiser’s paintings do not end “happily ever after”—resolution of the conflict is in the hands of the viewer. This is the moment in history when we must make a choice between life and extinction. That’s as dramatic as it gets. 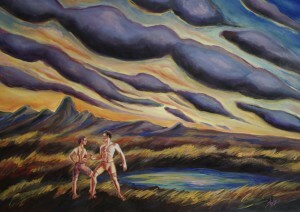 “Kinetic Connections,” is showing at the Women’s Building in Saint Paul, 550 Rice Street, through June 8, 2012. For visiting hours, contact WARM at info@thewarm.org or 612-567-9276. James Matthew Wilson, “Unleashed from the Exemplar: The Fate of Narrative in Modern Art,” 2009.